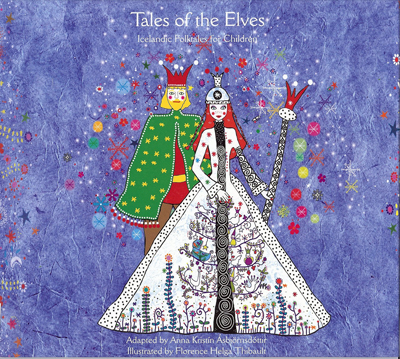 I found this story in a beautifully illustrated book of Icelandic folktales for children, Tales of the Elves, that I brought back from that country after a visit in 2012. One Christmas Eve, a richly dressed woman knocked at the door of a farm house in Hrutafjord and asked for shelter. The sheriff lived there and said she could stay. When people asked her name, she said it was Bothildur, but she would not say anything else about herself. She stayed home while everyone else went to midnight mass, and when they returned, they had never seen the house so clean and beautifully arranged. The sheriff invited her to stay on as housekeeper, and she excelled at her work. The following Christmas Eve, she stayed home again, but this time, when the household returned, they found Bothildur’s eyes red from weeping. On the third Christmas Eve, Gudmundur, the sheriff’s shepherd boy, vowed to discover her secret. As everyone walked to church, he feigned illness and turned back. Gudmundur possessed a magic stone that made him invisible. Holding it in his hand, he slipped into the farmhouse, where he saw Bothildur dressed in the finest clothing he’d ever seen. She took a green cloth from a chest and set off into the night, with Gudmundur following closely behind. They came to a lake where Bothildur spread the cloth on the water and stepped onto it. The shepherd boy just had time to step onto a corner before the cloth began to sink. It seemed like they were passing through smoke as they sank deeper, but at last they came to a grassy plain in front of a fair city. Bothildur entered the city where everyone cheered. A man who wore a crown embraced her and then everyone entered the church for Christmas mass. Bothildur’s three children ran around the pews playing with three golden rings, until the youngest dropped his and couldn’t find it because the invisible Gudmundur had slipped it into his pocket. When the service was over and it was time for Bothildur to leave, everyone was sad. She walked alone with her husband onto the plain before the city. Both were in tears and Gudmundur heard them say this was the last time they would ever meet. They parted with great sorrow as Bothildur stepped onto the green cloth with Gudmundur behind her. Bothildur returned home and was cleaning when the sheriff and the rest of the household returned. Gudmundur came home later. When asked where he had been, he told the entire tale of his trip to the land below the waters. When Bothildur asked if he had proof, Gudmundur withdrew her son’s golden ring. At that she was joyous. She explained that she’d been a queen in Elf Land until a witch cursed her. She could only return home on Christmas eve, and only a human brave enough to follow her to the world below could break the spell. “Now you have released me and you shall be richly rewarded,” she said. After saying goodbye to the household, Bothildur vanished. That night, Gudmundur dreamed she came to him and gave him coins and jewels which he found beside his pillow when he awoke. Later, he used that money to buy a farm of his own and get married. In time, he became known far and wide as the luckiest man alive. In Iceland, winter solstice celebrations were huge events – understandably, for by mid-December, the southern part of the country gets only four hours of light each day, and the northern regions, above the arctic circle, get only three. Icelanders embraced Christianity in 1000 AD, but to this day, Christmas is a dual holiday, celebrating both the birth of Christ and the return of the sun. Charming as it is that the doorway to the Other World should open on Christmas Eve, it’s a safe guess that Christmas is peripheral to the tale. Stories of release from enchantment are found in every culture and predate Christianity. Sometimes love and compassion break the spell, as in “Beauty and the Beast.” Sometimes it’s bravery and cleverness, and sometimes even violence – in the first version of “The Frog King” published by the Brothers Grimm, the frog is disenchanted not by a kiss, but when the princess becomes so annoyed with him that she hurls him against a wall. Aside from its simple charm, what fascinates me about Queen Bothildur’s tale is that Gudmundur, the young disenchanter, brings his own magical implement for the task. Where do shepherd boys pick up magical stones of invisibility? 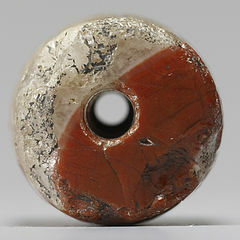 Jung believed that stones are frequently symbols of the Self, his term for the fully integrated personality. Normally, such psycho-spiritual integration is the task of a lifetime, but in stories, legend, and scripture, young heroes as diverse as King David, St. Patrick, and Krishna worked as shepherds or cow herders when they were young. However simple this folktale may be, it reflects what can be done by a person with a noble cause who is not at war with himself. Belief in the Huldufólk, or Hidden People, the Elves, is common to this day in Iceland; in a 2007 survey, 57% of the population said they “do not disbelieve” in Elves. In 2004, Alcoa had to pay a government expert to survey their proposed site for an aluminum smelter to make sure it was Huldufólk free. Last year, we travelled a highway that had been diverted around an Elven dwelling. We saw many small houses built on remote hillsides as homes for the Hidden People, and some Icelanders build them churches, in hopes they will convert to Christianity. Even so, as we read and tell their stories, I suspect the Elves are wishing us a Gleðileg jól go farsælt komandi ár – a Merry Christmas and a Happy New Year. This entry was posted in Article, Folklore, Holidays and Festivals, oral tradition, Spirituality and tagged Carl Jung, Elves, Fairytales, folklore, Iceland, imagination, Psychology, WPlongform. Bookmark the permalink. Absolutely charming. I love it when you tell folktales. You do it so well and they are mostly new to me as I’ve never spent much time with folktales, although someday I hope to. I am fascinated by research and the careful wording of questions, so the questions of “do not disbelieve” in Elves cracks me up. What a perfect way to ask the question to get such an affirmative response. Thanks for this fun post. I saw accounts of recent events in Iceland – like series of rockslides in 2011 – attributed to offending the Elves, so I guess in that often harsh climate, being careful of the Hidden Folk stands to reason! I love the blending of cultures in this story. I love too that the story shows us that the darkest of days provides the “right” time for the waiting that will bring an opening. I think that is what Advent symbolizes as well. My pleasure – I love stories like this. Thanks. Many of the folklore posts here are among my favorites, both because I find the subject matter so compelling, and because I learn so much digging into them.